This past week I had a reprieve from the cool spring air in Boston. I headed south to Atlanta for a work conference. The conference was held at Georgia Tech and we stayed right by campus in Midtown. My day job is spent doing marketing and admissions for an executive MBA program. The conference brought together marketing and admissions professionals from schools across the world to learn about current trends, share best practices, and do a lot of networking. Even though the conference schedule was packed, there was still time to check out some Atlanta eateries. To make room for the less-than-healthy eats I spent my lunch breaks walking around the Georgia Tech campus. With limited time available, I had to pare down my list of suggested restaurants. @JustinCanCook and @25Lifestyle had tweeted me some fantastic looking culinary options. Now I'll have a list for the next time! I was fully prepared to venture out on my own for these dining adventures. Luckily I found like-minded conference attendees and had dining companions during the trip. 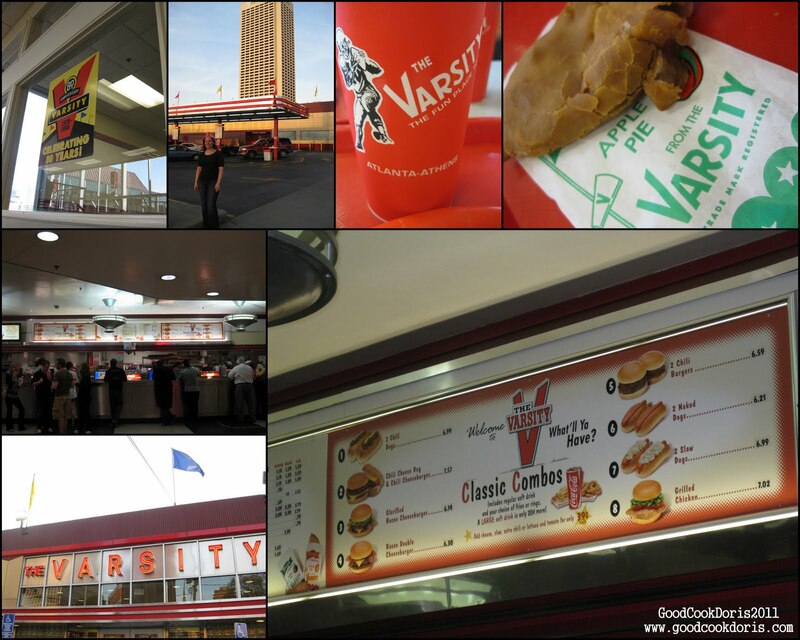 One spot that I've had on my list for a long time is an old Atlanta stand-by - The Varsity! "Two miles of hot dogs, a ton of onions, 2500 pounds of potatoes, 5000 fried pies and 300 gallons of chili are made from scratch daily." When dining out with new people, I find that it's helpful to explain up front that there will be excess ordering (to make sure to try everything) and picture taking before eating. My dining companion was understanding and I snapped a shot of her food first so she could eat a hot meal. After deciding on our orders, we approached a cashier calling out "What'll ya have? What'll ya have", and ordered up what we thought was a reasonable amount of food. I picked out a chili slaw dog, a grilled pimento cheese sandwich on white bread, and a frosted Varsity Orange to wash it all down. When I went back up to order a fried apple pie, I found out that we ordered a lot less food than everyone else. The man in front of me (clearly alone) ordered 5 chili dogs, fries and rings. The family to my right ordered almost two register screens worth of food. Even though we didn't sample as much as them we still had a great time. I picked up two cans of chili to take home along with some magnets and postcards. We took a walk past the GA Tech Football Stadium and tried to burn off a few calories from our meal. The next night we had an opportunity to try another Atlanta hot spot after a long day of conference sessions. If you are a Top Chef watcher, you'll know that Richard Blais is the culinary director for Flip Burger Boutique in Atlanta. Since I've been on a streak of visiting Top Chef related restaurants on vacation, I knew I needed to try this out. The menu offered a variety of burgers, sides, drinks, and liquid nitrogen milkshakes. We all picked a shake (that's frappe if you are a native New Englander) flavor pretty immediately. No one was adventurous enough to order the foie gras shake, but we were all very happy with our choices. Turtle, and Toasted Marshmallow Nutella. I ordered the toasted marshmallow, of course! There were a lot of great burger choices for dinner. My dining companions were nice enough to let me snap a shot of their burgers before digging in. We each ordered a different side dish to be able to taste them all. All of the burgers were 5.5 ounces of brisket, short rib, and hanger steak. The burger was cooked perfectly and juicy and flavorful. On the top left below is the Butcher's Cut, blue cheese and caramelized onions, with fries. Top right, the bacon cheeseburger with vodka onion rings and beer honey mustard. Bottom right (my choice), the Local with smoked mayo, grilled onions, house made pickles and yellow tomato. You can see the fried bread & butter pickles in the background. 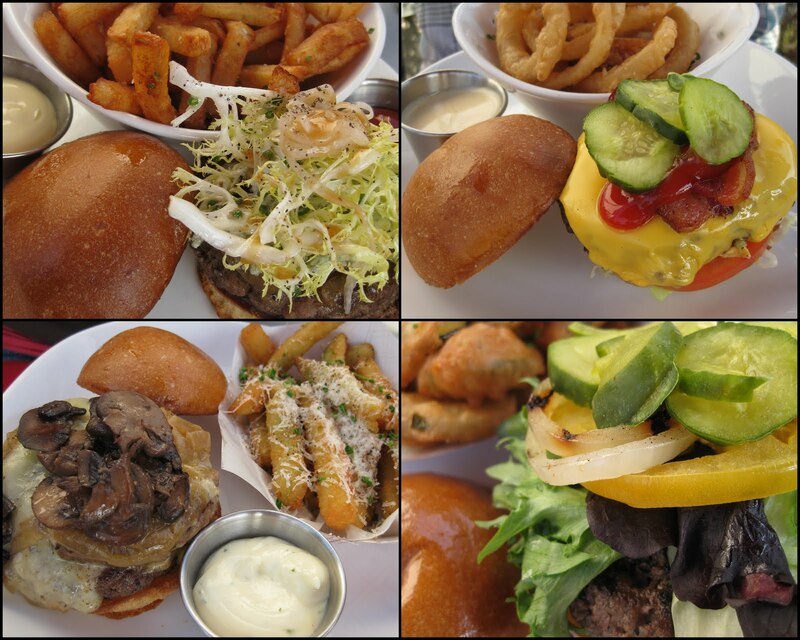 Bottom left is the d'Lux burger. This all out treat was 2 patties, truffle butter, roasted mushrooms, French onions, and cheese). On the side are deliciously crispy fried zucchini. My favorite side dish was the fried pickles and the fried zucchini. Hard to go wrong with either of those! One of the more adventurous in our group ordered up buffalo sweetbreads (definition here). Yep, buffalo flavored sweetbreads served with blue cheese and ranch foam. I was a little hesitant, but decided to go for it. You could still taste the sweetbreads through the buffalo sauce and the foam was a nice creamy contrast to the tang of the sauce. I can't say I'd order these again, but they were fun to try! After dinner, we decided to take a scenic ride down Peachtree through Buckhead and back to Midtown. One of the women had been telling us about a great cupcake shop and even though we were completely stuffed we made a stop. 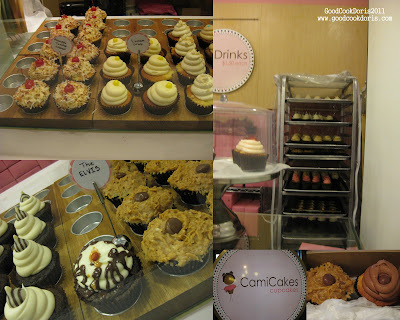 CamiCakes offers a huge case of creative cupcakes. Everything from classic vanilla to sweet potato to my choice, The Elvis. The Elvis is a rich chocolate cupcake topped with banana frosting, peanut butter, and a sprinkle of sea salt. It was delightful. Rich, sweet, salty, and wonderful. With cupcakes in hand we headed back to the hotel to sleep off our food comas. Thanks to the women who joined me in the dining fun! I'm looking forward to another trip to Atlanta to sample more Southern delights. Lara, all of this food looks SO delicious! I'm especially jealous of that milkshake! I had Flip Burger last summer for the first time & loved those fried zucchini as well! Yum. Wow - Flip Burger is making me insanely jealous. That seems like one heck of a business trip! sunglasses producer in up-market life-style products. Their revolutionary apps and world-class level of quality have designed a massive marketplace for their apps internationally. Design, innovation, level of quality and design are synonymous with Moncler.